People need more details on the practicalities of collecting stories in various settings, such as what to do when obstacles arise. The exercises (for story gathering and sensemaking) need more meat to them so people can get started using them more easily. The book needs a better "what's this all about" section that communicates the value of the approach (including why it differs from and complements other approaches). I'm also planning to do a book-wide jargon-reduction operation in order to reduce barriers further (so for example generation versus integration becomes story gathering versus sensemaking). I'm going to have to introduce a new piece of jargon for the title (Participative Narrative Inquiry, as I mentioned a while ago), because "Working with Stories" is just not a clear enough communication of the intent. So I've been going back and forth on what is the best way to write about gathering stories. I thought about writing "vignettes" or combined stories of all the things I've done and seen other people do, and how they turned out; but that didn't seem right, and I was afraid I'd inadvertently embarrass or offend people. I thought of answering questions in the manner of a frequently-asked-questions list; but I don't know, when the questions aren't real those always seem pathetic. Then I thought of What to Expect When You're Expecting, which for those who don't know is an essential book on pregnancy. What I liked about that book when I had occasion to use it was that it listed lots of things that could happen and what you should do if they do happen. I liked that a lot. I like to prepare for the worst when I'm facing the unknown. To make a long story short, after getting about 120 pages into this book, I called my best friend nearly in tears. I told her I was reading the book, and before I could go into details, she said "oh for goodness sakes, don't read THAT! It's all about what you can't do and what can go wrong." Honestly, I have no idea what all those people mean when they say that the tone of the book is condenscending and that the book is designed to scare you by pointing out everything that can go wrong... This is just not true! What I think it comes down to is that some people are like me and like to hear about all the awful things that could happen in advance, so that if those things do happen they can say, "Ah, I know what to do." But other people find preparing for disaster puts the whole thing in too negative a light and drains their energy. Clear and easy to understand, I felt the authors did not speak down to the reader, rather reassured me that none of my concerns are silly. They had a great way of keeping me CALM (as I am a fact seeker, and often read a little TOO much and scare myself!). Yep, that's exactly what I do. I'm a fact seeker too. But it's important in writing this book of advice (not about pregnancy, thankfully) to keep both ends of this range in mind, as well as the middle. The great thing about gathering stories, which like being pregnant is an augmenting process, is that people tell and listen to stories all the time. We already know how to do this, just like women already know how to have babies. For that reason being pleasantly surprised by what happens when you are gathering stories is just as likely as its opposite. So I think my plan will be to think of situations I've seen happen, but to try and come up with as many pleasant as unpleasant surprises, and to talk about the dangers and opportunities in every situation. So, I thought I'd start by coming up with some situations that arise in group storytelling sessions. I started by looking back over old notes from sessions I've run or observed (luckily I'm a great note-taker). I'm already up to fifty situations and still have lots more notes to review, so this is going to take longer than I expected and won't make it into this week's blog post. Instead, as I was looking back through old notes I found a batch of notes-to-myself on how people respond to being asked to tell stories in groups. It seems helpful so I've cleaned it up for general consumption. 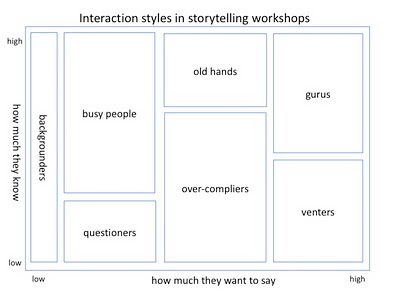 These are some styles of interaction I've seen in story gathering workshops, or ways people respond when asked to tell stories in a group setting. I give the styles character names as though they were whole people, but really they are simplistic caricatures that describe motivations. Any real person would be a mix of these, and the same people might react in different ways in different contexts or when confronted by different behaviors of those around them. Busy people don't have time to tell stories. They won't listen to a long introduction, won't participate in any exercises and won't read anything. They constantly remind you that you are wasting their valuable time and are the most likely to walk out of the session. To get busy people to contribute, show them what they will get out of helping you by telling stories. Maybe they'll have an easier time doing something, or people will stop bothering them with questions, or an issue they care about will be improved. Busy people want to believe their time is not being wasted, and they need to be sure of a return on investment for every minute they spend with you. Show them how their time is being used effectively. Gurus know so very much about the issues you are exploring that they feel threatened by the session. They might feel it decreases their store of knowledge or spreads it around too much, or they might feel you are trying to get something out of them for nothing. But while gurus feel threatened, they are also drawn to the session since the issues it explores are things they feel they have authority over. Their stories are prepared and purposeful, with strong hints that they know a lot more than they could possibly tell. They might view stories about mistakes or feelings to be trivial and inferior to what they have to offer, so they might inhibit others from talking. To get gurus to contribute and tell useful stories, and to give others room to talk, make it clear that your purpose is not to capture what they (alone) know but to understand the experiences of people of all levels of understanding and skill in the subject. Gurus need to know that their knowledge asset will be respected. Show them that you are not after what they are guarding, and that what you need is something they can share freely without losing anything. Questioners have heard that people are going to be exchanging experiences in the session, and they want to use the session to learn from others, perhaps even to gather some secrets that only the gurus and busy people (those in authority) know. So they ask a lot of questions. I've seen people find the most knowledgeable or highest-status person they can and grill them about the subject, essentially ignoring your goals. Questioners don't tell stories, and they prevent other people from telling stories as well, since they are looking for facts and advice, not unimportant ramblings about mistakes and feelings. If questioners and gurus get together it can ruin storytelling, because questioners can lead gurus easily into lecturing. (This is less true for busy people, because they don't have time for questioners and send them to other sources of information.) To get questioners to tell stories and leave the gurus alone, remind them that your goal is to learn about diverse experiences, including theirs, and that they can ask direct questions at another time. If your topic is one you think people will come wanting to learn about, have some resources on hand that questioners will find valuable. By giving questioners valuable answers you can meet their goals first, and then ask them to help with yours. Old hands know a lot about the issues, but they aren't in a position to guard or value that knowledge. They understand what you are doing and are usually happy to help, and they actively come up with useful stories. However, old hands tend to step aside when the gurus start to talk, because they have no interest in what the gurus want. Questioners don't ask old hands questions because they don't publicize or prepare their knowledge. So even though the old hands know a lot about the issues, they may be the least likely to tell the useful stories they have to tell. To get old hands to contribute, make room to let them talk. But do it without disparaging your gurus (who will outshout the old hands) or drawing the attention of your questioners (who will grill them). The best way to give old hands room to talk safely is to make sure everyone has room to talk; that way you are not seen as privileging anyone. Also, if you can quietly identify the old hands to yourself, see if you can follow up with them to gather more stories outside the workshop, for example in interviews. Venters come to the workshop with a list of problems or messages fixed in their minds that they have a great need to deliver. They might know about your goals, but they are more concerned with their own. Venters pour out energy about the issues they are upset about, but they often aren't interested in telling stories because it seems like a less direct and effective way of voicing their concerns. Venters sometimes buttonhole the busy people or gurus in the workshop because they think (rightly or wrongly) that those are the people in charge, so those people must be brought to listen to their complaints. To venters, collecting stories might seem a polite way of avoiding the issue, which they will not tolerate. To get venters to tell stories, convince them that you do want to understand their perspectives and feelings, and that in fact is exactly why you are asking them to tell stories. Venters want to believe they can have an impact. Show them how they can do that by telling stories. If you expect a lot of venters in your workshop, come prepared with a special complaint line or other method by which venters can speak their piece outside of the workshop. This will help them reach their goal so they can turn their attention to helping you reach yours. Over-compliers. These people might know some valuable things, but they want to help too much and try too hard. They do exactly what you tell them, and they are worried about following the instructions perfectly. If you slip up and say the story should involve three people, all of their stories will involve exactly three people. Over-compliers don't bring out very much of their real experiences, because they don't think you could actually want the boring facts of their humdrum existences. Their stories are even more purposeful and distorted than those of the gurus, because they see the session as a test they are desperately trying to pass. To get over-compliers to contribute, help them understand that you really do want to know about the mundane details of their lives. Explain that what you want is just what everyone does naturally and that there is no need to perform; just talk about things that have happened. They want to do the session right. Show them how so they can. All of these styles can tell great stories, and a storytelling session can mix them all together and still succeed. They are not pathologies of storytelling as much as markers on the landscape: knowing how to recognize them puts you in better control of getting where you want to go. They can help you detect signs of danger and opportunity and react to them quickly to nip a problem in the bud or capitalize on a potential. 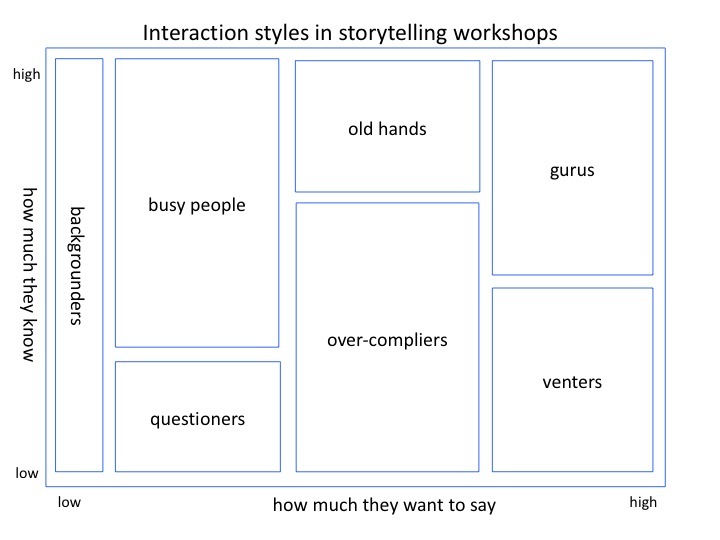 This graph shows where the styles fall on two dimensions: how much people know about the issue you are exploring and how eager they are to tell you things about it (though not necessarily useful stories). This graph shows the same thing, but with interactions between the styles overlaid. Note that the old hands and backgrounders are in danger of falling out of the conversation and need to be kept in. 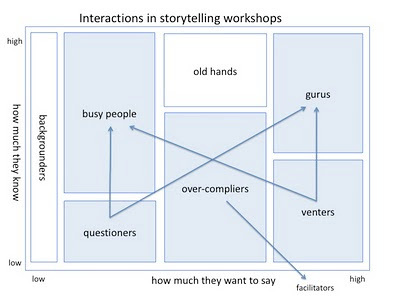 Questioners, venters and over-compliers (those where the arrows start) are the most likely to set off less-productive patterns, so those tendencies are likely to need the most attention to guide the conversation towards the sharing of raw stories of experience. So, hopefully that's helpful to some people planning to gather stories in groups. Look for more practical advice in these areas in the weeks (hopefully not months) to come. Please do comment if you would like to point out gaps, mistakes, unseen opportunities, arrogant blasphemy or transcendent wisdom!